Stoney Point AgriCorp., Inc is now Melissa Feeders. Located in Melissa, Texas, about 50 miles north of Dallas, this family owned operation has been serving the beef industry and local community for almost 25 years. Providing customers with unique cattle raising expertise across all breeds and ages, Melissa Feeders can help you improve herd genetics through breeding or optimize gains through feeding. In 2008 Melissa Feeders (Stoney Point at the time) was recognized with the Regional Environmental Stewardship Award presented by the National Cattleman's Foundation. The company was recognized for their focus on enviromental awareness, including the Turf Grass initiative and the Alternative Feeds milk reprocessing plant in Dallas. If you would like to learn more about the environmental projects and their impact on the environment, please follow the Environmental Stewardship link. Have you ever wonder where your beef comes from or how the animals are treated? Melissa Feeders is USDA certified for Source and Age Verification and audits all facilities that handle the animals for overall best management practices. All animals at Melissa Feeders are overseen by employees with over 40 years in the beef industry and the facility was designed with cattle comfort in mind. The ever changing climate of north Texas can be a challenge but sloping pens with plenty of shade and solid feeding aprons ensure your cattle will be able to handle all seasons. The breeding facility allows each heifer to have individual attention for heat detection and insemination and all heifers are palpated to ensure breeding success. If you would like to learn more about Melissa Feeders services, please follow the link for Services. 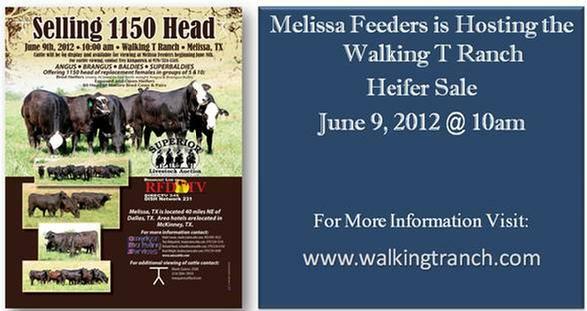 Melissa Feeders is a family owned company specializing in all areas of the beef and dairy beef industries. We are proud of the strong team of industry experts that are working hard to build upon our solid foundation. Please utilize our webpage to learn more about all Melissa Feeders has to offer, our products and how you can get involved.